Sitting is considered by doctors as the new smoking. The more you sit, the more you are lowering your chances of a long and healthy life. But that is a not possible for writers. We sit for long hours in front of our computers. That is where the Pomodoro technique comes to your rescue. Stretch, walk about, do deep breaths, do whatever that will help your body to relax during the breaks. The output of this technique is unbelievable. I use this technique regularly while I write or blog. Your productivity can increase manifold if you create a distraction-free environment during these sessions. I have written 1000 words per session using this technique. Just imagine how many sessions can you squeeze in a day! Because of this technique, I am able to cross off most of the items on my to-do list. 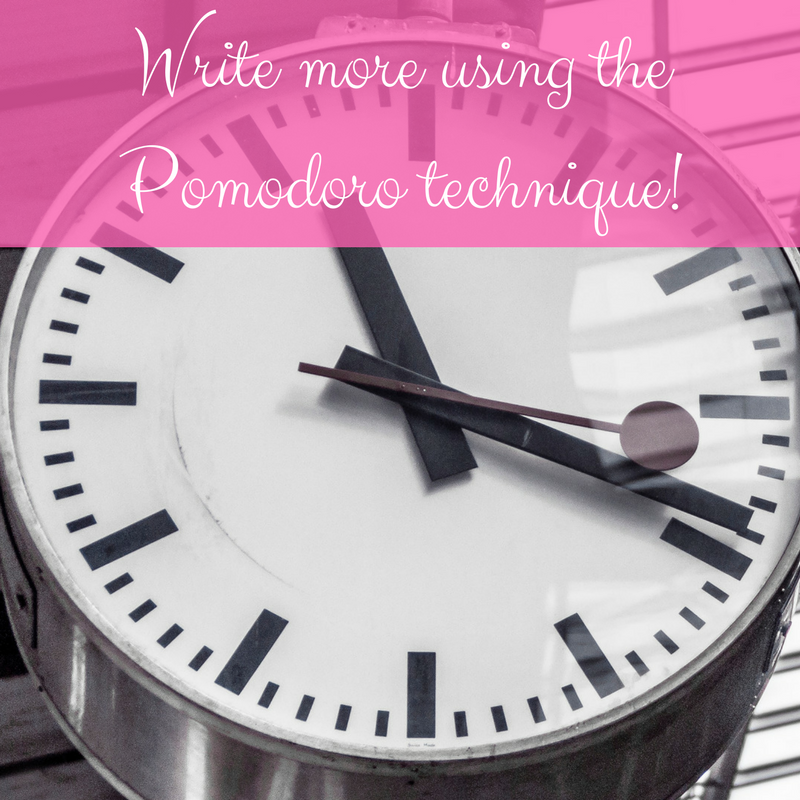 There are Pomodoro apps you can download. Or you can use the timer on your computer or phone or watch. How can you write more using this technique? Before you start, plan what you will write during the session. Make notes about the post/scene you are going to write. Switch off the internet, so that you are not distracted during the session with pings, emails or social media notifications. Stop when the timer goes off. This will be helpful to make you remain in the flow even after the session ends. Take a break and resume writing in a fresh new session. I have completed writing a novella within a month using this technique. That too while blogging, doing my household chores, reading, exercising and looking after a naughty 8-year-old. I don’t spend hours staring at the blank screen thinking about what to write anymore. When I sit in front of my laptop, I have a note in front of me which will guide me. All I have to do is to expand the ideas. 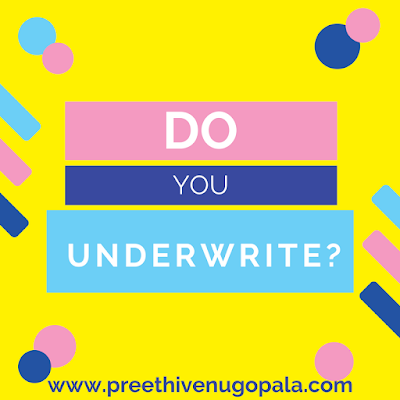 I am guilty of underwriting. Or should I say, I was? I began writing fiction via short stories where the story happens within a short span of time. You cannot indulge in long descriptions of either the place, the person or the emotions in a short story. When I started writing my novel, my technique of writing was the same. I used to treat each chapter like a short story with a clear beginning, a middle and an end. It is perfect as far as scene structure goes. But what about the details? As a result, my first drafts are often the thinner versions of my final book. I add in details later. Once I have laid down the rough draft of the story, the next phase is adding in scene details. With writing software like Scrivener, I can do this easily. What are the details that should go into a memorable scene? Details of the place: Use the senses to describe the smells, sounds and emotions the place evokes in the character. You can also talk about the geographic location of the place if the character is new to the place. Emotions: The emotions of the characters add depth to the scenes and story. Describe the emotion using the last scene as a reference. What is the current emotion of your character? The previous scene in your story must have affected the character in some way. Describe it. Reactions of the character: We react to every important moment in our lives. We react viscerally, emotionally, physically and intellectually to any occurrence, exactly in that order. So should our characters. And yet each character will react to a particular action in their own unique way. A girl who is scared of cockroaches would scream and run the moment she sees one. She won’t pause to think logically as to whether the tiny cockroach can harm her. Similarly, a man scared of heights would panic the moment he realizes he is at the edge of a cliff. Find and write down appropriate reactions of your characters. Dialogues: Dialogues are a very important element in your novel. Crisp, meaningful dialogues that take the story forward should be included in your scenes. Dialogues are considered as 'action' in any scene. Hence you are showing and not telling by using them. If it doesn't do either of these, the scene doesn’t belong in your book. You can remove it. The final goal of the main character should be there as an undercurrent in any major scene. It should be the driving power of the story. Are you guilty of underwriting? If yes, what do you do? Man is a social creature. He needs his tribe to remain sane. Same goes for every writer. We need our tribe. Our tribe is as important as oxygen is for life. When you venture into writing, so many things happen out of the blue to you. Some of the usual stumbling blocks that trouble every newbie writer are writer’s block, one-uppers, critics, and psychic-vampires. When writer’s block visits, you are forced to play the reluctant host till it leaves. You babysit and fret over the troubles it is giving you yet have no clue how to make it leave. The one-uppers will make you feel awful by telling you how they have done it all, before you even thought about it. Well good for them. But it does dim your light. The critic, who has never written a novel will tell you where you went wrong in your novel, which character sucked and why you should pack your bags and leave. The psychic vampires will stick to you and emotionally blackmail you to get things done. You will do their chores fully convinced that you are duty bound to help the poor darling. You will help them to edit their Facebook posts, their blog posts and even the messages to their ex. You are a writer after all! This is where the presence of your tribe is going to help you. Your tribe is your group of writer friends who will listen to your woes and offer the perfect solution. Their words bring sunshine back into your life. “You are a fool. She is using you. She is no damsel in distress who needs rescuing. She is a psychic vampire. That is what she is. Leave her." Amazing, right? They will tell you what you need to hear. They have been there, done that. 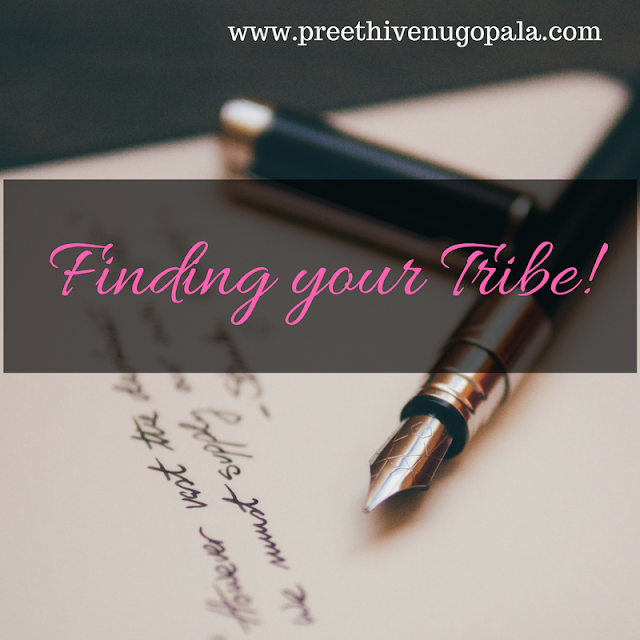 So how to find your tribe? Join a Facebook/twitter group of writers who you know and respect. Take creative writing classes. You will meet like-minded people. When the others take a bite out of your troubles, it vanishes within no time. Your tribe will become your guiding light. So, go find your tribe. Whenever I make a new acquaintance and I tell them I am a writer, I often get asked this question. Where do I find my stories? I believe every story finds its writer. Sounds esoteric, but I have reasons to believe it is true. This September 26th, the eBook version of my novel ‘Without You’ will turn two. It has remained in the top 100 books in its category ever since it release-date and reached the #1 position on Amazon multiple times. Amazon gave it the #1Bestseller tag recently. It has 244 ratings on Goodreads, and 59 reviews on Amazon India till date. All these stats are organic. My Kindle reports tell me thousands have read my book till now worldwide. And this story idea came to me in a dream. I saw the entire story like a movie. I remembered only the prominent scenes by the time I woke up. I immediately jotted down whatever I remembered. The names of the characters, the places it happened, I jotted them all down. The reason I got the dream was I was troubled about the Mangalore Plane crash of 2010. 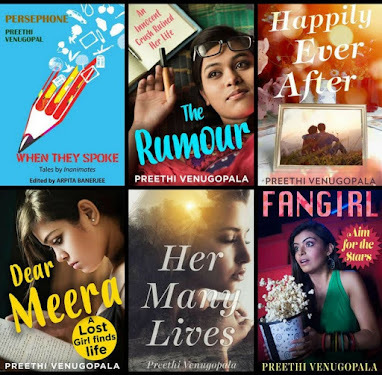 Till now, five of my short stories have been published traditionally. Four are in paperback and one as a standalone eBook short story on Juggernaut Books. I have signed a contract for 9 other short stories. I have a published novella which was co-written with 7 other bloggers. I have three books for kids published online as well. Some of these stories came to me out of nowhere. I have never sat in front of a blank screen brooding about what to write. Sometimes, I have a clear idea about the story, as in, scene by scene clarity. But sometimes all I have is a vague idea and an urge to begin. Read this quote by Games of Thrones writer George R.R.Martin. The architects plan everything ahead of time, like an architect building a house. They know how many rooms are going to be in the house, what kind of roof they're going to have, where the wires are going to run, what kind of plumbing there's going to be. They have the whole thing designed and blueprinted out before they even nail the first board up. I am neither an architect nor a gardener. I am a hybrid. I have to plot my scenes, give my story a structure before I sit down to write. But when I start a story, it has a mind of its own. Then I watch how it unfolds and go along with it. I have a few good mentors. I turn to them whenever in doubt. I also need to have a clear head before I sit to write. Meditation helps in a big way. How many of you know that there are apps (both android and iOS) which allow you to read books from your phone? That too free of cost? I have quite a good number of friends who aren’t aware of this simple fact though they would love to read free books. This post is an answer to that question. I personally use these apps that I am going to list and can assure you they give the best reading experience ever. I am linking the apps to the Google Playstore. You can find them in the Apple Store too. 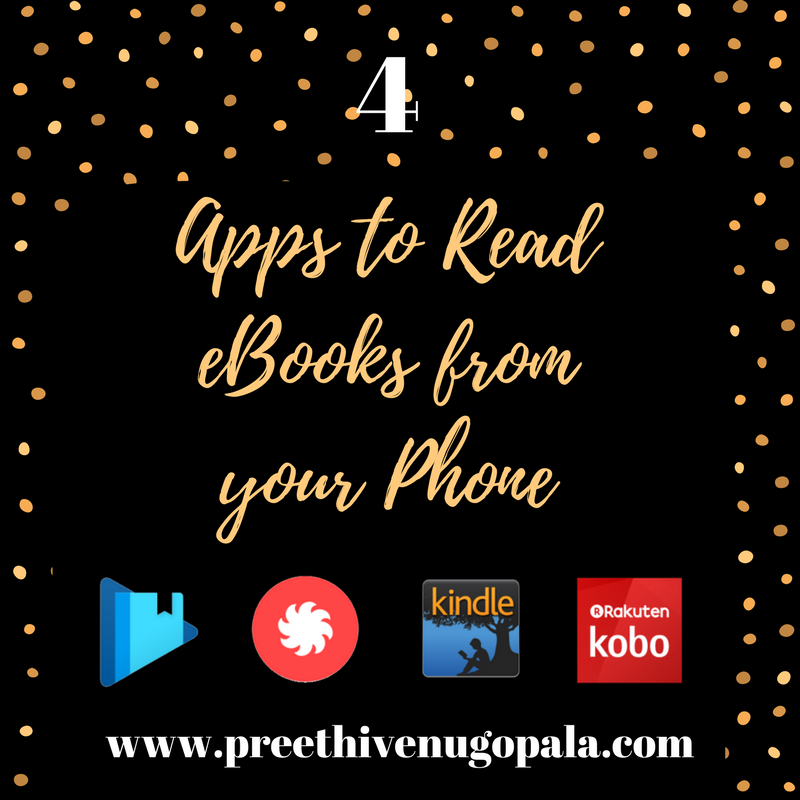 Kobo Books is an app that provides you with over five million eBooks that you can purchase and read. The app will sync your bookmarks and library, recommend new books based on your reading habits, and it comes with a few extra features like Night Mode. It’s not bad once you get a few books in your collection. Being a very basic app, it doesn’t allow you to read books that you already own. There are books that are permanently free too. Also, they also provide audio books too. The Amazon Kindle app leads me to my favourite online bookstore, Amazon. I am a Kindle Unlimited subscriber as well. They also have separate eBook reader devices like Kindle Paperwhite, Kindle Fire etc to give you a hassle free, close to paperback type reading experience. Kindle, like Kobo, is a standalone book store to buy and read eBooks. It has a gigantic selection of free as well as paid books. It will sync your bookmarks and library and you can also use a built-in dictionary, sample books before buying them. Kindle Unlimited subscribers can “borrow” books from their library. Juggernaut is India’s answer to Amazon’s Kindle app. Their moto is to provide books to Indian readers at never before discounts. You can purchase books for amount as low as 10 Rs. How cool is that? They have a good collection of classics which are free to download. They also encourage users to upload their own stories onto their writer’s platform. If your story is good, you might end up with a publishing contract with Juggernaut. This isn’t one of my favourites. But they have a good collection of books. They have free eBooks to download and also you can purchase the latest offerings from best selling authors. The books also sync across devices like Amazon Kindle. Because of all these apps, I have stopped buying paperbacks these days. Unless it is a book which doesn’t have an eBook edition, I don’t purchase paperback. I love bookmarking, highlighting and taking notes from the books I read. With these, I have my highlights and notes from each book saved, with easy to refer and search options. I am hence a complete eBook lover these days. Should I mention the huge discounts and free eBooks too to entice you? Last Sunday, we were invited by Full of Toys, Jayanagar for a playdate, a chance to engage in an hour-long playtime slot with any of the toys in their store. My husband was out of town, so it was just me and the kid who went to check it out. Full of Toys is a brand of internationally sourced educational toys promising entertainment and education for children between the age of 4 to 12. We have our set of board games and indoor games sets to keep our kid engaged. We even go out for bird watching, small trips and nature walks to introduce him to nature. But then, I am a writer and blogger. I don’t get enough time to spend with him. Hence, I was eagerly looking forward to this play date. We were welcomed warmly by the owner of the store Gautam Gupta and his very efficient staff. The store is a comfy place with stacks of educational toys. There were tables arranged for various groups of parents and children. We were ushered to our table. The staff member, Gopi, brought a toy and explained the rules to us and we began. 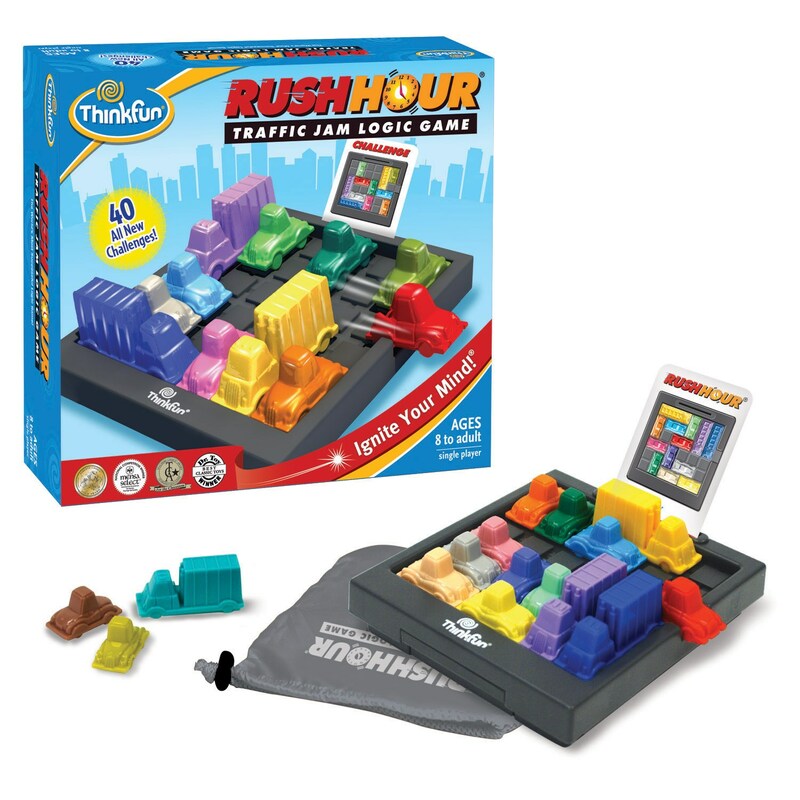 The first toy my kid played with was Rush hour. This award-winning toy is suitable for ages 8 and above. It is a puzzle game that demands analytical thinking and reasoning to get a car toy out of a traffic gridlock. To play, he had to pick a challenge card and arrange the cars on the supplied grid board according to the pattern. The cars could be moved back and forth to clear the way for the red car to drive out. The game has 40 levels with difficulty ranging from beginner to expert. The solution is printed on the back of each challenge card just in case a player gets stuck. It was very interesting how he got engrossed in it pretty soon. After solving a particularly difficult level, the staff member rewarded him by bringing him another interesting game. 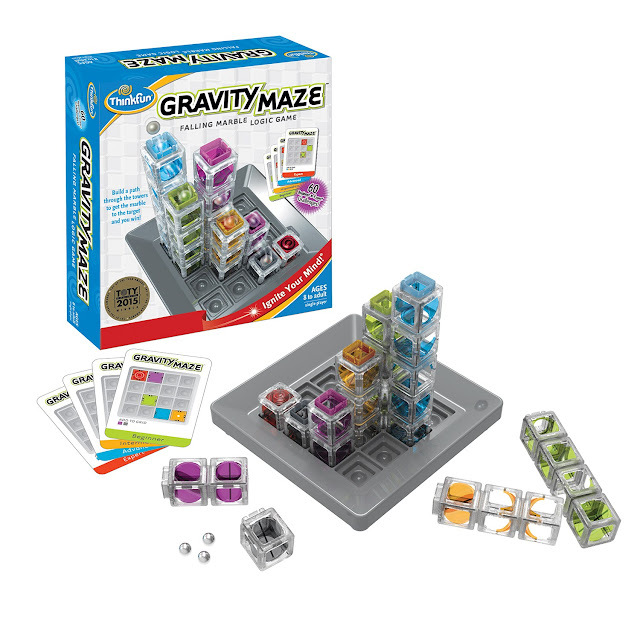 Gravity Maze is a building and construction puzzle game that required him to be an architect to beat the 3D challenges. He had to build towers and mazes to get the ball to its target to win. It aims to give the kids a flair for building and architecture as they tackle this innovative puzzle game. Designed for kids 8 years old and above, Thinkfun Gravity Maze is good for both boys and girls. This game too had 60 levels. The third game he chose was Circuit Maze. It seeks to ignite logic and sequential reasoning skills of the kids. The goal of the game is to arrange the various tokens provided to create a real circuit that lights up the different coloured Beacons. I was skeptical about the choice because I was not sure whether he could grasp the concept of circuits and electricity to play the game. I must confess, he surprised me. He even solved a few difficult levels all by himself. 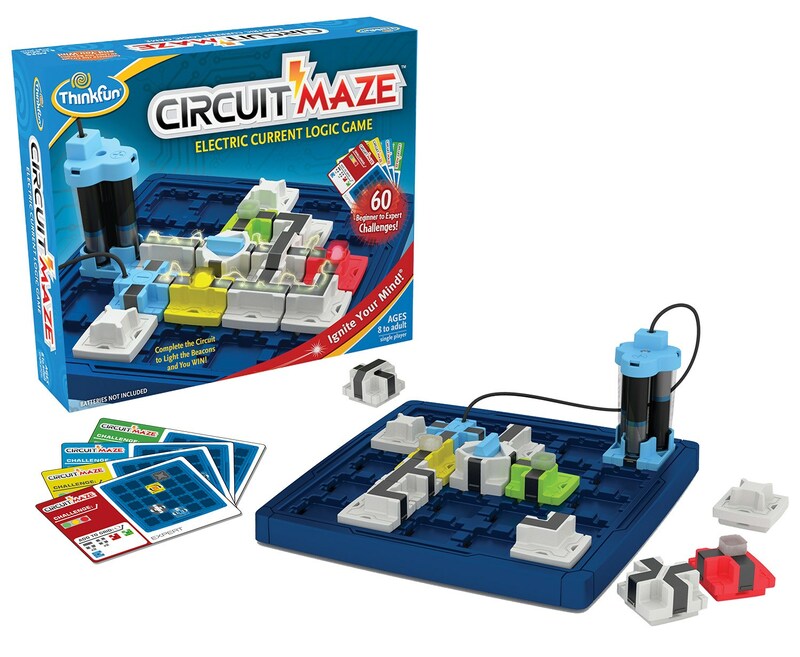 This game is a sure-fire way to boost the brainpower of your kid and introduce them to the concept of electricity. It has 60 challenge levels ranging in difficulty from beginner to expert. By the time our hour ended, he was excited to have discovered these games and promised the store staff that he would bring his friend with him next time. I was curious as to how the concept of such a store came to be while the logical thing would have been to go for a shop with the latest popular kids’ brands. The owner Gautam Gupta shared his own experience how while doing his masters he started using Lego for coding. This was a new concept for him and led him into thinking about introducing the concept to kids. Also, he wanted to bring back family playtime which is slowly vanishing from homes these days. All in all, it was a wonderful experience. The best thing is that the playdate is free for all. The staff doesn’t persuade you to buy by extolling the virtues of their product. The main aim is to introduce the concept of playtime and educational toys to families. They stick to their tagline: Full of toys is where children play to learn and parents learn to play. If you wish to connect with Full of Toys, check their Facebook Page and Twitter. 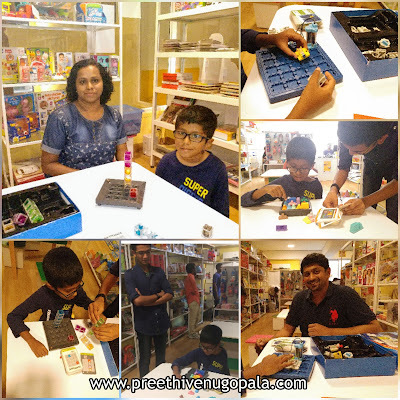 Check this video to know more about the playdate at Full of Toys. Declaration: This is a sponsored post. But the review of the toys, the store, and the experience are unbiased and true. 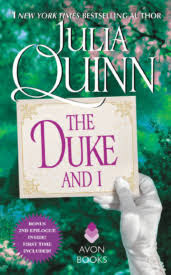 Any new book by Julia Quinn is an auto-buy for me. I love historical romances and Julia Quinn is the one author whose books are worth every penny you spend. They have romance, a fairy-tale setting, intrigue, and tons of laughter. More than that, I have reread some of her books multiple times. 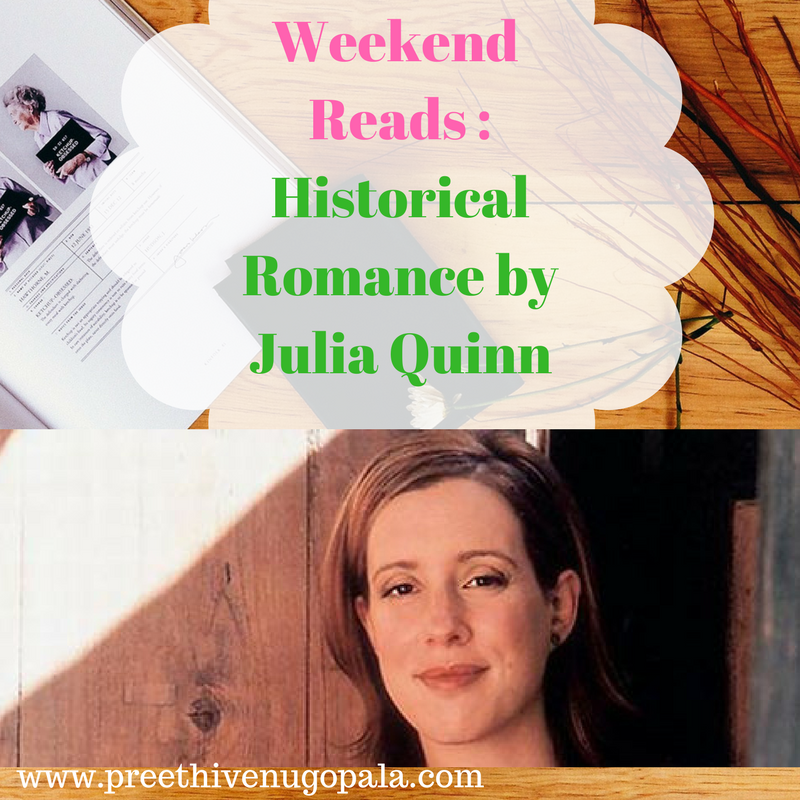 So, this weekend, I want to introduce some of her books (my favourites) to you. 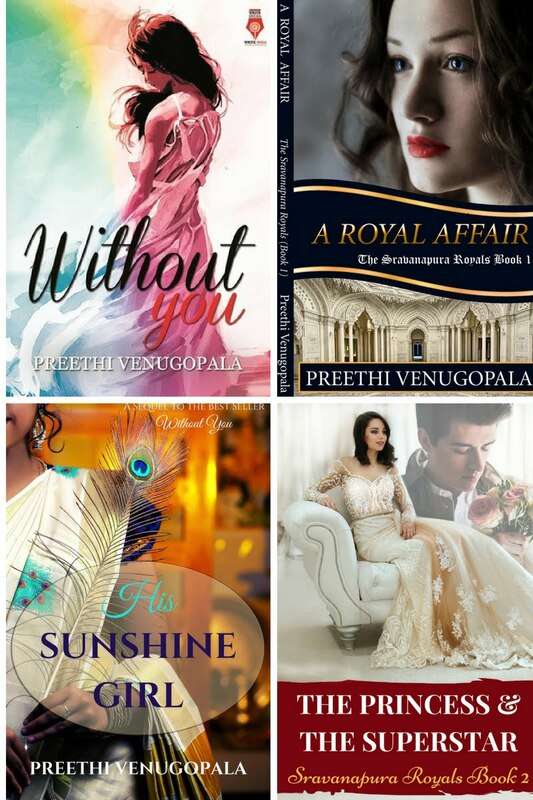 Among the four books I am recommending, three are from the Bridgerton Series. Please excuse me, I love the Bridgertons. 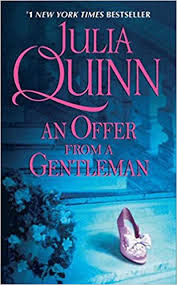 This is the debut book by Julia Quinn and I loved every bit of it. 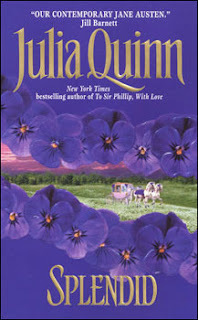 Emma's character is so well written that she is my favorite among all Julia Quinn heroines. And yes, it is hilarious, filled with toe-curling love scenes and of course, (sigh) a swoon-worthy hero. Will she accept his offer before the clock strikes midnight? Who was that extraordinary woman? Ever since that magical night, a radiant vision in silver has blinded Benedict to the attractions of any other—except, perhaps this alluring and oddly familiar beauty dressed in housemaid's garb whom he feels compelled to rescue from a most disagreeable situation. He has sworn to find and wed his mystery miss, but this breath-taking maid makes him weak with wanting her. Yet, if he offers his heart, will Benedict sacrifice his only chance for a fairy tale love? What I loved: I love the story of Cinderella. This is another Cinderella Story which is far more poignant, filled with writing and incidences which will make you fall in love with the characters. And of course, who doesn’t love a fairy-tale remade into an unforgettable historical romance. Benedict Bridgerton and Sophie will make you forget the original Cinderella and the Prince. Period. 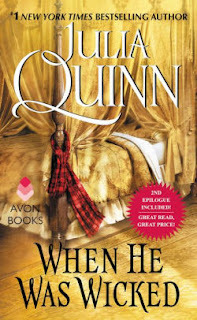 What I loved: This is the first book of the Bridgerton series that I read and made me fall in love with the Bridgerton Clan. Simon Basset and Daphne will dazzle you with their hilarious dialogues, fights and of course a sizzling romance. In every life, there is a turning point. A moment so tremendous, so sharp and breathtaking, that one knows one's life will never be the same. For Michael Stirling, London's most infamous rake, that moment came the first time he laid eyes on Francesca Bridgerton. I heart books with second chances in love. Here Francesca Bridgerton doesn’t seek love, it finds her. The entire story was a compelling read for me. I have read it multiple times and each time, I loved it for a different reason. Michael Stirling is without doubt a drool worthy hero. 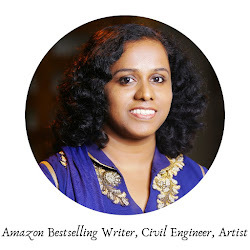 If you are by now tempted to buy her books, click the below link to check out her books from Amazon.